September began with rainy unsettled weather caused by the passage of yet another tropical cyclone – the third in two weeks to affect the region. Severe tropical storm Mawar made landfall on the night of the 3rd to the east of Hong Kong and then passed to the north. It brought squally showers but wind speeds were much lower than during the previous two storms; typhoon signal number 3 was hoisted on the morning of the 4th for a few hours. Records of note at Mai Po were a Eurasian Hoopoe on 1st, a Black-winged Kite on 2nd, and a Swinhoe’s Egret, a Common Tern and two Garganeys on 3rd. Tai Po Kau had a Tiger Shrike, an Asian Brown Flycatcher and two Hainan Blue Flycatchers on 1st. Three Amur Paradise-flycatchers, an Arctic Warbler and a Speckled Piculet were at Pak Sha O on 2nd. At Shek Kong catchwater, the first Yellow-rumped Flycatcher of the season was recorded on 2nd and two Amur Paradise-flycatchers and two Hainan Blue Flycatchers were also noted. A further two Amur Paradise-flycatchers and two Hainan Blue Flycatchers were reported from the same location on 5th, along with a Brown-breasted Flycatcher, a Dark-sided Flycatcher, an Arctic Warbler and an Orange-headed Thrush. Birds seen at Long Valley on 4th included a Yellow Bittern, 63 Black-winged Stilts, nine Pintail/Swinhoe's Snipe, a Common Snipe, two Long-toed Stints, 25 Little Ringed Plovers, two Plaintive Cuckoos, 14 Eastern Yellow Wagtails of the nominate race tschutschensis, an Oriental Reed Warbler and a Zitting Cisticola. On 5th, a Eurasian Hobby was at Lam Tsuen, and an Amur Paradise-flycatcher and Asian Brown Flycatcher were at Chek Lap Kok. Sightings from the urban migrant trap at Ho Man Tin included a Tiger Shrike on 7th, a Brown-chested Jungle Flycatcher on 8th, and Amur Paradise-flycatcher and Yellow-rumped, Hainan Blue, Grey Streaked and Asian Brown Flycatchers on 9th, along with two Pale-legged/Sakhalin Leaf Warblers. At Mai Po on on 9th, the HKBWS ringing group trapped Tiger Shrike, Thick-billed Warbler, Pale-legged Leaf Warbler and five Oriental Reed Warblers. On 10th, a tired Eastern Crowned Warbler was found on the floor in Mei Foo mall and released in a nearby park. Shek Kong catchwater had Amur Paradise-flycatcher, Grey-streaked, Asian Brown and Hainan Blue Flycatchers, and a Pale-legged/Sakhalin Leaf Warbler. The days continued to be hot (36⁰C at Sheung Shui on 16th! ), humid and showery, although a north-easterly wind from the 13th onwards had a slight cooling effect, bringing the first vague hint of autumn. Two more tropical cyclones passed well to the northeast and southwest of the territory. A couple of belated reports: a Styan’s Grasshopper Warbler was trapped at Mai Po on 8th and there were a few migrants at Po Toi on 10th, including Brown Shrike, Asian Brown Flycatcher and Grey-streaked Flycatcher. The HK Bird Ringing Group that mist-nests in one of the reed beds at Mai Po caught a Middendorff’s Grasshopper Warbler and a Manchurian Reed Warbler on 12th. The Middendorff’s is only the sixth record for Hong Kong. Also at Mai Po on the 12th there were single Asian Dowitcher, Sharp-tailed Sandpiper and Far Eastern Curlew among the waders on the mud flats. The over-summering sub-adult Caspian Gull (mongolicus) was also present. On the main reserve an all-dark swiftlet passed through after a thunderstorm; this is apparently the first dark-rumped swiftlet to be reported in Hong Kong since 1994. The identity of such birds remains a mystery. On 14th, two Arctic Warblers and single Hainan Blue, Yellow-rumped and Blue-and-white Flycatchers were seen at Shek Kong catchwater where there was also a good count of 15 Grey Treepies. An Amur Paradise-flycatcher was on Cheung Chau on the same day and one or two Ashy Minivets were at Lung Fu Shan on HK Island. A Siberian Blue Robin, Oriental Dollarbird, Black-capped Kingfisher and two Arctic Warblers were seen on Po Toi. On 15th, there was a record count of 107 Intermediate Egrets at Lok Ma Chau. At San Tin there were eight Whiskered Terns and a Stejneger’s Stonechat. A Tiger Shrike was seen along the red walk at Tai Po Kau. Yellow-rumped Flycatcher: singles at Tai Po Kau and Po Toi. Other records of interest on 16th were Bay Woodpecker, Speckled Piculet, eight Lesser Necklaced Laughingthrushes (currently Cat. III) and the long-staying Blue-winged Leafbird (Cat. III) at Tai Po Kau, and Indochinese Green Magpie (currently Cat. III) at Lau Shui Heung. On 17th, a Siberian Blue Robin and an Orange-headed Thrush were seen at Ng Tung Chai, along with four Arctic Warblers, two Pale-legged/Sakhalin Leaf Warblers and a Hainan Blue Flycatcher. The Tiger Shrike remained at Ho Man Tin, where a Thick-billed Warbler and a female Blue-and-white Flycatcher were also present. Eight Oriental Dollarbirds were at Wonderland Villas near Kwai Chung. Birds seen from the Mai Po boardwalk on the receding tide included an Eastern Marsh Harrier, six Red Knots and a Nordmann's Greenshank (rare in autumn). It was generally hot and sunny with temperatures in the low 30s ( degrees Celsius), becoming showery towards the weekend. Migration remained strong during the first three days of the week when there were fairly widespread reports of Oriental Dollarbirds, Brown Shrikes, Arctic Warblers, Pale-legged/Sakhalin Leaf Warblers and Asian Brown Flycatchers, but became far less intense after 20th. On 18th, the ringers at Mai Po had an excellent session; birds trapped included Tiger Shrike, two Siberian Blue Robins, Styan’s Grasshopper Warbler, Baikal Bush Warbler, Thick-billed Warbler and two Pale-legged Leaf Warblers. A Black-winged Kite was also seen on the reserve. Other sightings on 18th included Tiger Shrike and two Black-naped Monarchs at Ho Man Tin, a Japanese Sparrowhawk and Yellow-browed Warbler at Wo Hop Shek, single Lanceolated and Pallas’s Grasshopper Warblers at Chek Lap Kok, and a Japanese Quail at Long Valley. Passage birds at Po Toi on 19th included an Oriental Cuckoo, three Black-naped Orioles, three Oriental Dollarbirds, five Asian Brown Flycatchers, a Grey-streaked Flycatcher and three Blue Rock Thrushes. A Black-naped Monarch and two Dark-sided Flycatchers were on Cheung Chau. The first Ashy Drongo of the autumn was reported from Shek Kong catchwater. Five swiflets sp. were seen at the Wetland Park, including one dark-rumped bird. On 20th, sightings at Lam Tsuen included 12 Oriental Dollarbirds, an Ashy Drongo, a Black-winged Cuckooshrike and three Golden-headed Cisticolas. A Japanese Paradise Flycatcher occurred at Shing Mun and there was a Eurasian Wryneck at Chek Lap Kok. One lucky birder resident in urban Kowloon found a Slaty-legged Crake on his patio; fortunately the bird had not hit any windows and flew away safely. A trickle of arriving winter visitors were noted at Mai Po during the week. These consisted of at least four Great Cormorants on 20th, two Northern Pintails and a Tufted Duck on 22nd; the first Black-faced Spoonbill on 23rd (with two on 24th) and a Northern Shoveler on 24th. Other records of interest from the reserve were six Black-naped Orioles and 490 Garganeys on 22nd, the Nordmann’s Greenshank (first seen on 17th) until at least 23rd, the over-summering Caspian Gull (mongolicus) until at least 24th, and Swinhoe's Egret on 24th. Elsewhere, a Pechora Pipit was at Ho Man Tin on 22nd, and Long Valley had a Eurasian Hobby, a Pallas’s Grasshopper Warbler and a Chinese Grosbeak on 23rd. There were five Whiskered Terns at San Tin on 24th. A Yellow-rumped Flycatcher was photographed at Tsing Yi on 24th. Finally, photos of the "Oriental" Cuckoo at Po Toi on 19th were recently posted on the HKBWS website and the bird has been re-identified by Paul Leader as Lesser Cuckoo. See http://www.hkbws.org.hk/BBS/redirect.php?tid=26623&goto=lastpost#lastpost . The seemingly never-ending summer dragged on with temperatures up to 35⁰C in the New Territories. A slight surge of the northeast monsoon on the last day of the month brought some welcome rain to the territory in the morning but the afternoon reverted to form, becoming hot and humid. A series of records from the Wetland Park at Tsim Bei Tsui included Himalayan Swiftlet, Brown Shrike and two Red-throated (Taiga) Flycatchers on 25th, Japanese Quail and two Red-throated (Taiga) Flycatchers on 28th and, best of all, a young Malayan Night Heron on 29th. Mai Po had six Blue-tailed Bee-eaters, a Siberian Rubythroat and three Black-winged Cuckooshrikes on 26th. An Orange-headed Thrush, Blue Rock Thrush, Amur Paradise-flycatcher and Siberian Blue Robin were at Ho Man Tin on 27th. A Dusky Warbler and Richard’s Pipit were at Long Valley. 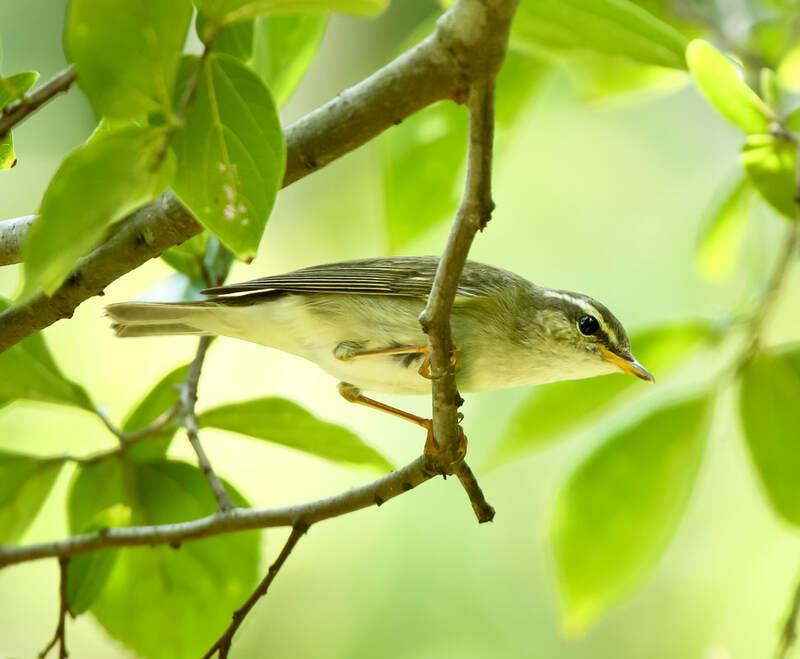 A Forest Wagtail and Oriental Dollarbird were in the Shui Hau-Lo Kei Wan area of southern Lantau on 28th, and a Japanese Sparrowhawk and ten Pacific Swifts were at Shek Pik viewpoint. The same Lantau-based observer also saw about 60 distant mid-sized raptors – probably Grey-faced Buzzards - soaring above the Soko Islands in two tight groups; this would be an exceptional count for this species in autumn. Lamma held a few migrants on 30th including Brown-breasted Flycatcher and Japanese Sparrowhawk. There was also a variety of common migrants at Pui O on Lantau including two Pacific Golden Plovers, four Pintail/Swinhoe’s Snipe, 28 Eastern Yellow Wagtails, 11 Black Drongos, Brown Shrike, Dusky Warbler and Zitting Cisticola. Five Grey-headed Lapwings were at the usual wintering site on the Kam Tin river.